Utah Rep. Ben McAdams supports universal background checks for gun buyers. Utah’s Republican members all vote no. 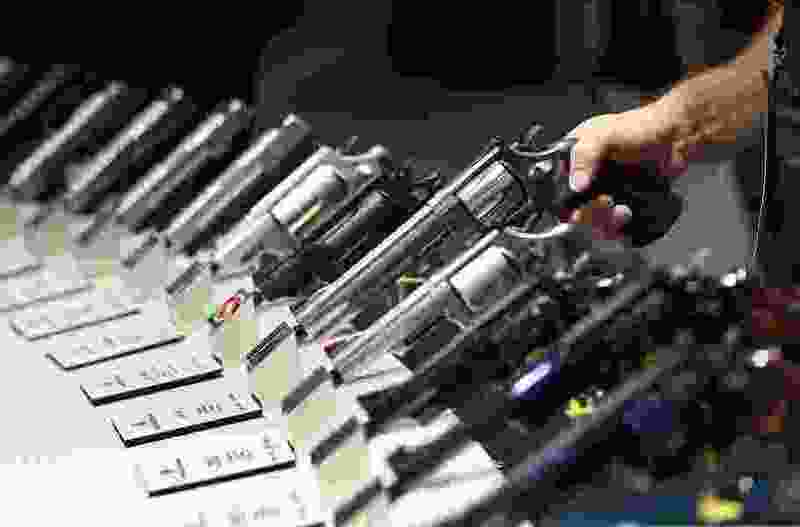 (John Locher | AP file photo) In this Jan. 19, 2016, file photo, handguns are displayed at the Smith & Wesson booth at the Shooting, Hunting and Outdoor Trade Show in Las Vegas. The U.S. House has passed legislation that would close the so-called gun show loophole, requiring background checks for all gun sales, including private transactions. Washington • Utah Rep. Ben McAdams joined fellow Democrats to pass legislation Wednesday expanding federal background checks for gun purchases while Utah’s three House Republicans voted against the measure. The bill, which passed 240-190, is the first time Congress has significantly acted on gun control legislation since the 2012 Newtown, Conn., massacre of schoolchildren and staff and a slew of mass shootings since. Federal law already requires background checks for people purchasing weapons from licensed dealers but gun control advocates argue that loopholes allow people to buy firearms at gun shows and in private sales that bypass screening for convicted felons and others legally barred from access to firearms. Utah Reps. Rob Bishop, John Curtis and Chris Stewart, all Republicans, voted against the measure. The measure is likely doomed in the Senate, where Republicans are in control. Senate Majority Leader Mitch McConnell, R-Ky., isn’t expected to bring it up for a vote. The White House has also said President Donald Trump would veto the bill if it passed Congress. The legislation would require background checks for all gun sales or transfers, including private purchases. Gun control advocates hailed the passage of the bill Wednesday and pushed for the Senate to have the courage to follow suit. “Today’s historic gun safety victory in Congress is a testament to courage,” said former Arizona Rep. Gabby Giffords, who survived an attempted assassination in 2011 when a gunman shot her in the head and killed six others. Previous efforts to bring up gun control legislation in the House when it was controlled by Republicans have failed despite a wave of mass shootings. The government moved to ban so-called “bump stocks,” devices that accelerate firing of bullets in semi-automatic rifles, after a Las Vegas massacre left 58 people dead and more than 800 injured. Republicans on Wednesday were able to push through an amendment to the legislation that would require notifying Immigration and Customs Enforcement if someone in the country without legal documents attempts to buy a weapon and is caught in a background check. McAdams voted for that amendment as well as for the bill.